We have beautiful and uniquely designed Rakhis for you to choose from. Take a look at our Rakhis online- from simple and understated patterns to brocade and intricate threadwork or with mirrors- whatever you want, we have it for you. 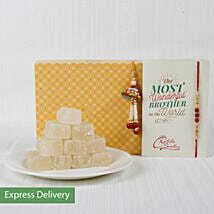 Choose from our collection and we will make a rakhi online delivery for you. 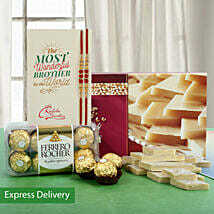 Sweeten the deal even more and send your siblings some delicious chocolates and sweets along with your Rakhi. 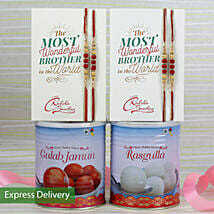 Send your rakhi with sweets to Aurangabad. Use this festival season to express your gratitude and make your loved ones feel truly special by loading them with gifts. 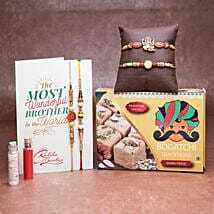 Go through our website of gift ideas for your sibling and choose a rakhi. 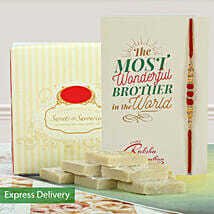 Before you send rakhi to Aurangabad, choose your accompanying gifts in the form of scrumptious sweets. Rakhi is all about getting nostalgic. We know that in our busy life, it is actually not possible to spend time with our families like we used to do earlier. And that’s why this occasion is all the more vital. 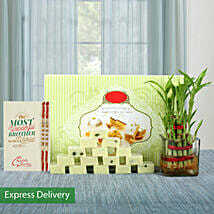 Still, if you cannot be at home, you can always send rakhi and sweets to Amritsar online using our service. Our fixed day delivery now ensures that no matter when and where you place the order, you and your family in Aurangabad can receive Rakhi gifts on the stroke of midnight on the day of Raksha Bandhan or whichever you want. With just a click of a button you can buy Rakhi with Sweets in Aurangabad and have it reach you in time. Raksha Bandhan is a wonderful occasion for reaching out and bonding with your family members. And you can create wonderful moment with our gifts.